The recent sops for the sugar industry will help only in the short term at best. For long-term health, the most important measure will be to link prices of sugar and cane. Many would have thought that the sugar industry lost a champion in Sharad Pawar when the Congress party-led United Progressive Alliance (UPA) lost power in the recent general elections. After all, Pawar as agriculture minister during the UPA's 10-year rule had helped bail out the sugar industry out of many a crisis. But the exit of the UPA and Pawar doesn't seem to have any adverse impact on the sector's fortunes, what with the new National Democratic Alliance (NDA) government announcing a sweet deal for the industry in its first month of rule. The NDA government, led by the Bharatiya Janata Party (BJP), announced a slew of measures for the sugar industry on June 23. These include providing interest-free loans of Rs 4,400 crore for two years, retaining export subsidy of Rs 3,300 per tonne, increasing import duty on sugar to 40 per cent from 15 per cent, and doubling the amount of ethanol blending in petrol to 10 per cent. The government has indicated it will implement these measures only after the industry submits a payment schedule to clear its massive arrears to sugarcane farmers. The industry has welcomed the measures that it says are critical to helping both mills and farmers. "You cannot afford to sit back and relax when the country's sugarcane farmers have not been paid over Rs 10,000 crore," says Abinash Verma, Director General of the industry group Indian Sugar Mills Association (ISMA). The previous UPA government had taken several initiatives to help the sugar industry from time to time. The biggest reform was undertaken in April last year when the UPA eased government control over the sector. Previously, the government of the day decided the so-called levy obligation under which mills had to sell one-tenth of their produce at a discounted price for the public distribution system, as also how much sugar each mill could sell on the open market every month. The UPA ended both practices. The Congress-led alliance had also introduced ethanol blending in petrol. Power production from bagasse, a by-product of sugar manufacturing, also got a push during the UPA regime. Pawar, who was also food minister for seven years during the UPA's rule, was seen as someone who understood the sugar sector better than other politicians. But his proposals were opposed by his cabinet colleagues at times because it was thought that any incentives for the sector would benefit Pawar and his Nationalist Congress Party, which has a base in Maharashtra, the country's largest sugar producing state and the second-largest cane grower. That the NDA is also doling out financial incentives for the sugar industry now does not seem surprising considering the results of the recent general elections. One-fourth of the BJP's Lok Sabha MPs come from Uttar Pradesh, the biggest cane grower and the second-largest sugar producer. The BJP won 71 of 80 seats in Uttar Pradesh, which helped to take its total tally to 282. In Maharashtra, the NDA got 41 of 48 seats - the BJP won 23 and the Shiv Sena 18. Besides, assembly elections in Maharashtra will be held later this year. Cane farmers form a large vote bank in both states. 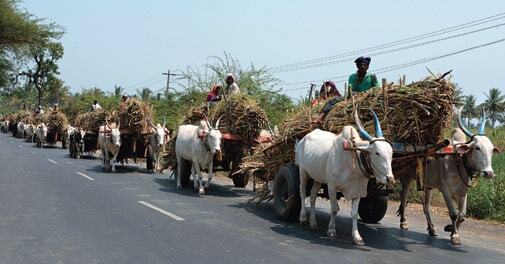 Uttar Pradesh alone has more than four million cane farmers, and mills owe Rs 7,000 crore to farmers in the state. Prime Minister Narendra Modi highlighted the issue while addressing an election rally in February in Meerut, a prominent cane-growing area in western Uttar Pradesh. Modi criticised the state government for mills' arrears to farmers and boasted the timely payment to farmers and the higher cane productivity in Gujarat, where he was then chief minister. Although Gujarat contributes only about four per cent to the country's 25 million tonne sugar output, mills in the state are cooperatives run by farmers and follow a system where the price of cane that mills pay to farmers is linked to the revenue realization from sugar. Another reason why sugar turned out to be the first sector whose demands were met by the new government is the presence of several lawmakers from sugar or cane-producing regions in Modi's cabinet. Nitin Gadkari, Minister for Road Transport, Highways and Shipping, owns sugar mills in Maharashtra while constituencies of Women and Child Development Minister Maneka Gandhi (Pilibhit) and Minister of State for Agriculture and Food Processing Sanjeev Balyan (Muzaffarnagar) are important cane belts in Uttar Pradesh. Deep N. Mukherjee, Senior Director (Corporate Ratings) at India Ratings and Research, says these short-term steps will only provide liquidity to the sector. "The liquidity pressure is an outcome of artificially determined cane prices at unsustainable levels. To the extent government intervention with determining input prices are not minimised, the sector would continue to move in and out of distress," he says. "Patchwork support to farmers as well as mill owners will not help anyone in the long run." Mill owners say states such as Uttar Pradesh use cane prices as a political tool. They argue that, based on sugar prices, they can only pay Rs 231 per quintal of cane for the sugar season that began in October 2013 while the state government fixed the price at Rs 280. Consequently, mills owe a massive amount to farmers. Also, many sugar makers in Uttar Pradesh have been suffering heavy losses for two years, as the market price of sugar remained stagnant due to surplus stocks while the cane price rose. The average national sugar price has dropped from Rs 36.64 a kilogram in April 2013 - when government control over the sector was eased - to Rs 36.12 a kg in June this year, government data show. Sustained losses have eroded the net worth of Mawana Sugars, which has registered with the Board of Industrial and Financial Reconstruction in a bid to revive itself. The net worth of Simbhaoli Sugar, also based in Uttar Pradesh, has been eroded as well. Sugar makers in other states are also going through tough times. Coimbatore's Rajshree Sugars, for instance, restructured its debt earlier this year. Sakthi Sugars, based in the same Tamil Nadu city, is undergoing a similar process. Mill owners say the most important step the government should take to ensure the health of the sugar industry on a sustainable basis is to link cane price with sugar realization. In October 2012, a government committee headed by former Reserve Bank of India governor C. Rangarajan suggested that cane and sugar prices should be interlinked. Although this suggestion hasn't been implemented, the committee's report was the basis of the UPA regime's decision to ease control over the sugar sector in April last year. Sugar-linked cane price has worked in several other countries including Brazil, the biggest sugar producer, as well as Thailand and Australia. In India, while Maharashtra and Karnataka have initiated steps to adopt a formula to decide canes price, Uttar Pradesh has yet to move forward in this direction. "How can a mill in Uttar Pradesh compete with a mill in a state like Maharashtra or Karnataka that pays a much lower price for sugarcane?" asks Gaurav Goel, Managing Director at Dhampur Sugars, which is based in the northern state. Ajit Shriram, President of ISMA and Deputy MD at agri-business company DCM Shriram, says that many states in western and southern India have linked cane and sugar prices and that the central government should try to convince other states, especially in the north, to follow the same practice. "This will ensure survival of the industry and zero arrears to farmers," he says. Narendra Murkumbi, MD of Renuka Sugars, concurs. "The central government has done its best to salvage the industry," he says. "States should now respond and get out of the business of fixing sugarcane prices to appease the vote bank."